Browse: Home / anecdotes, personal history / Great, Grand. It started in a backyard in Tucson, back in April. We’d gathered out there for a memorial for my cousin Jimmy. Among the photos people were perusing was one I didn’t recall seeing before. 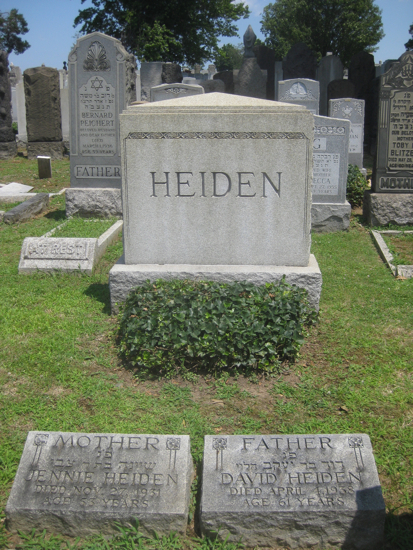 It was my great-grandparents, David and Jennie Heiden. I was a little taken aback. I can’t say I ever gave much thought to any of my great-grandparents, as they were all gone long before I was around. But here they were, staring me in the face. Living, breathing people. I liked that. I then discussed great-grandpa David with his grandson David and my cousin Douglas’s father-in-law, Marvin, who is a bit of a genealogy enthusiast. They had done some research but didn’t know what town David had come from in the old country (Russian-Polish border). Maybe the graves surrounding David and Jennie’s would yield some clues. 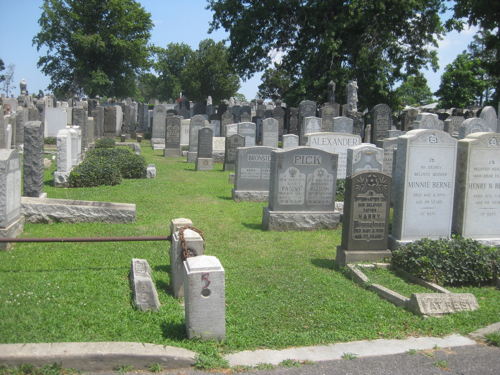 Turns out they were buried in Mount Hebron Cemetery in Flushing, Queens. I suggested that when I was back east, I could head out there and take some photos. Seemed like the sort of thing I would do. I wrote a note in my phone. Flushing is a bit of a schlep from Hoboken, so ideally I would multitask. A map revealed that the cemetery was quite close to Citi Field; I imagined that I’d make it out to at least one Mets game during the summer. If I went to a night game, I could head out early and… yeah, that would work out well. In early June, I received a postcard from the New York Blood Center. If I donated at a drive in Secaucus, New Jersey, on June 15, I would get a free pair of Mets tickets. 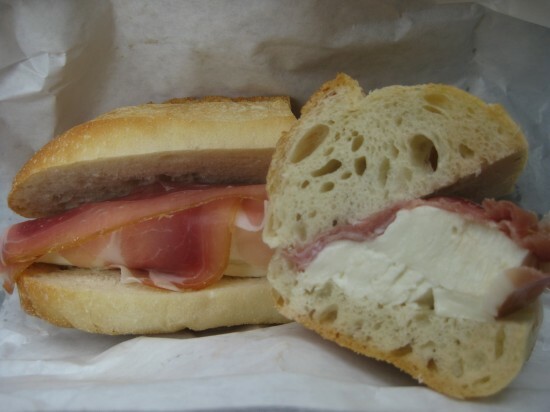 Win-win-win-win: I like giving blood, I like free tickets, I could now schedule my cemetery visit, and there’s a deli in Secaucus with some of the best fresh mozzarella around. Had not yet received the tickets when I met up with my uncle Gene in early July. 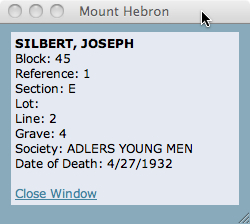 He coincidentally mentioned my Silbert great-grandparents: Joseph and Mary, if you can believe it. I asked where they were buried. Out in Queens, Gene was fairly certain. 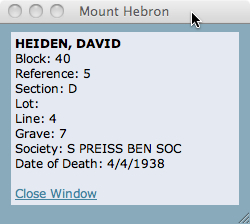 When I got home that day, I went onto the Mount Hebron Cemetery website. 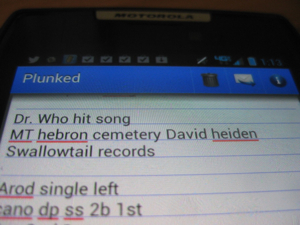 Their interment search is extremely helpful. 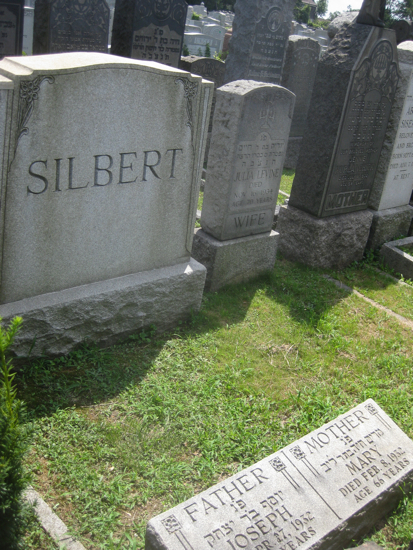 And sure enough, Joseph Silbert was also buried there. It was not uncommon for an apartment building in New York City to house only immigrants from a particular town or village from the “old country.” As part of the dynamic of the building, a social structure emerged in the form of a landsmanshaft or society or a synagogue, sometimes formal and incorporated and sometimes just a confederation of like-thinking individuals. The society provided for the social life of the inhabitants of the building, and in some cases provided health coverage of sorts and burial benefits. 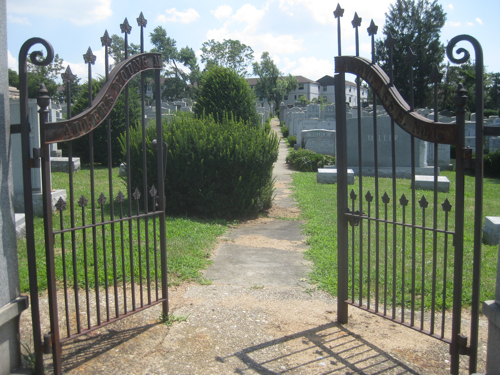 The societies would purchase large tracts of land at local cemeteries for burials of its deceased members. Now, as far as getting to cemetery, I could go by subway, but then the walk to the stadium seemed a bit tricky. I decided to drive. I am not crazy about any drives that require going through Manhattan, but midday weekday probably wouldn’t be too bad. Also, I’d be returning home after the game, when traffic would be lighter. And of course, I had E-Z Pass now. It was a hot and humid but clear day as I headed out around noon: Lincoln Tunnel, across Manhattan, Queens-Midtown Tunnel (wait, I’m driving from midtown to Queens—so that’s how it got that name), the L.I.E., exit 22E, through the intersection… whoa. It was right there. In fact, I was just past the entrance on a one-way road. Hmmm. Possible to loop around? Would I end up back on the highway? I did not want to do that. Maybe I could just… back up. If this traffic clears. Lots of cars, right here at the meeting point of the Long Island and Van Wyck Expressways. I’ll just back up next time the light turns red. Worst case scenario, I die in a fiery crash right outside a cemetery, which would be pretty freaking cool if you ask me. Made it safely onto the grounds. It was quiet, as one might expect. 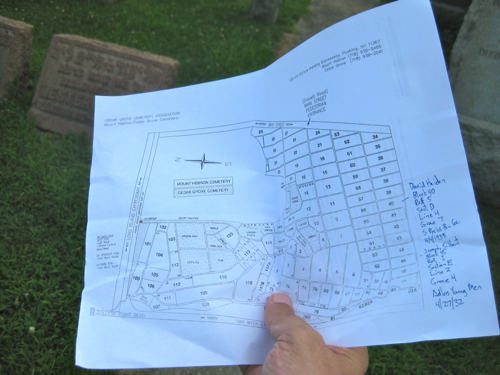 I had a map which I had printed off the cemetery website and annotated with the grave-location information. 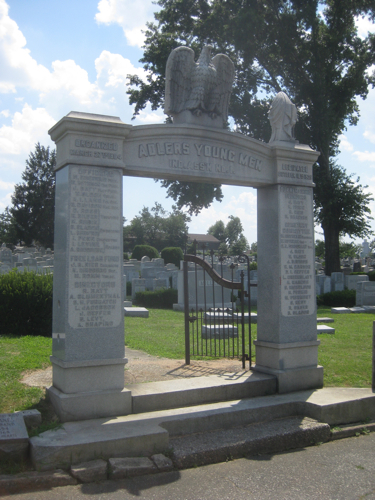 Each society usually commemorated the organization in some manner, such as granite gates at the entrance to the society’s burial grounds emblazoned with the name of the society or village it represented, the names of its past officers, etc. OK, no worries, I had several more pieces of information. Reference 5. What was a “reference”? I walked the perimeter again, looking for numbers I could put in some sort of context. A-ha, the society markers had red number stickers on them. And they were in order. I continued walking until I saw it, a somewhat tattered red 5. 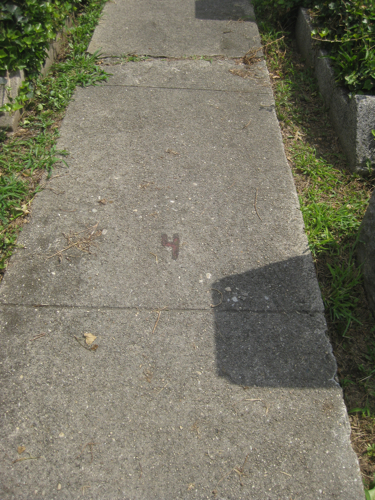 And now, uh, section D, line 4, grave 7… I decided to just wander around till I found it. Even though I knew what I was looking for, it still caught me by surprise to see it. Kind of strange to see a familiar name way out here, among so many unfamiliar names. Gussie Demsky. Kalman Zimmer. Fanny Seelig. Tillie Blitzer. 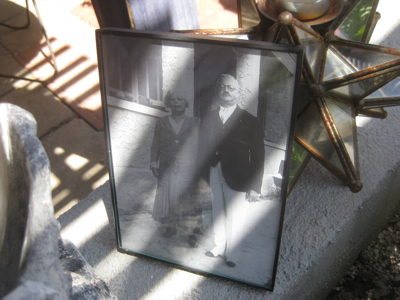 But there they were, my great-grandpa and great-grandma. The Heidens. I stood there and talked to them for a while. Introduced myself. Admitted that this was weird for me to do because “I don’t believe in ghosts.” Explained how people they knew had led to me. Filled them in on the family best I could. Wanted to say that I was connected to several of their other great-grandchildren on Facebook, but then realized I would have to explain computers. I finally decided to say that we are now able to very easily keep in touch with people who are far away, and that that made me very happy. I told them I loved them. Onward to the Silberts. I figured this would be much easier, as I was now an expert grave hunter. Drove five “blocks” to block 45 and prepared the walk this perimeter as well. But it wasn’t necessary, as the Adlers Young Men Independent Association No. 1 had a pretty prominent entrance. I walked through the gates like a gentleman. This was almost too simple; the line numbers were marked on the walkways. If that was line 4, then this is line 3, and this would be… Yikes, even more bizarre to see your own name up there. Mid-line, this one was trickier to reach than the Heidens, as the graves in this section were very close together. To take a photo, I went around to line 3 and sincerely apologized to Max Goldman, as I would need to climb up and sit on his tombstone to get any sort of angle. I spent some time with Joseph and Mary as well. I thought they might enjoy the fact that I was named after their son Jacob. And maybe they didn’t know that the parents of his wife, Anna, were buried not so far away, if they wanted to get reacquainted. But it’s tough to bring people up to speed on the last 80 years (did I really mention civil rights? ), and I was getting a little frustrated because I had just said a lot of this same stuff to David and Jennie, and, I really started to feel like a little kid who had maybe spent a little too much time visiting with the relatives. I told them I loved them, and that I try to be a good guy, I try to represent the name well, and I would keep trying. Which is right when I heard the Mister Softee theme. Unmistakable, somewhere in the distance, not too far. It struck me as odd, there in the cemetery, with nobody else around. I would keep trying, of that I was sure. But right now it was really hot. I turned away and went searching for ice cream. Wonderful, Jack. What an adventure. Did the Mets beat the Nats that night? Thanks so much, Diane! Despite having Dickey on the mound, that was #5 in a 6-game losing streak for the Metropolitans. I was excited to see Bryce Harper! This made me well up a little. Lovely. Awwww, what you told them was sweet. Don’t tell anybody, but I’m not ALWAYS a cynic. Truly though, this is a lovely story….thanks for sharing it. Thanks so much, Leah!! Hmm, I don’t THINK I’m related to any royalty…. You could become a researcher for people interested in family history, who live in other parts of the country but have family members buried in New York. Thanks, Marvin, and thanks for your key role in this adventure! Hmm, that is not a bad idea. I could even leave rocks/coins/flowers for a small surcharge. Great story, Jack. And, as usual, beautifully written. Who else can make a fiery crash outside a cemetery sound so endearing and heartwarming.